The Glow Cleanse is a 8 week detox diet, the 4th week is to be repeated for another 4 weeks. Glow Girl Rules For Life is a sample guideline of what a healthy balanced diet should look like. The Glow Cleanse is designed to help women cleanse and restart their digestive system, teaches new balanced habits and demonstrates just how easy healthy eating can be. It is based on a complete balanced diet as there are no exclusions of any food groups. Be expected to shift kgs, drop cms and tone up! The Glow Cleanse is a 8 week detox guideline, the 4th week is to be repeated for another 4 weeks. Glow Girl Rules For Life is a sample of what a healthy balanced diet should look like. The Glow Cleanse is designed to help women cleanse and restart their digestive system, teaches new balanced habits and demonstrates just how easy healthy eating can be. It is based on a complete balanced diet as there are no exclusions of any food groups. The healthy expected weight loss has been 0.5kg (minimum), per week and up to 5kg during the cleanse in the first month. Expect to lose cm’s, sleep better, have more energy, bright eyes and glowing skin!! Results are guaranteed even if you will not be exercising. 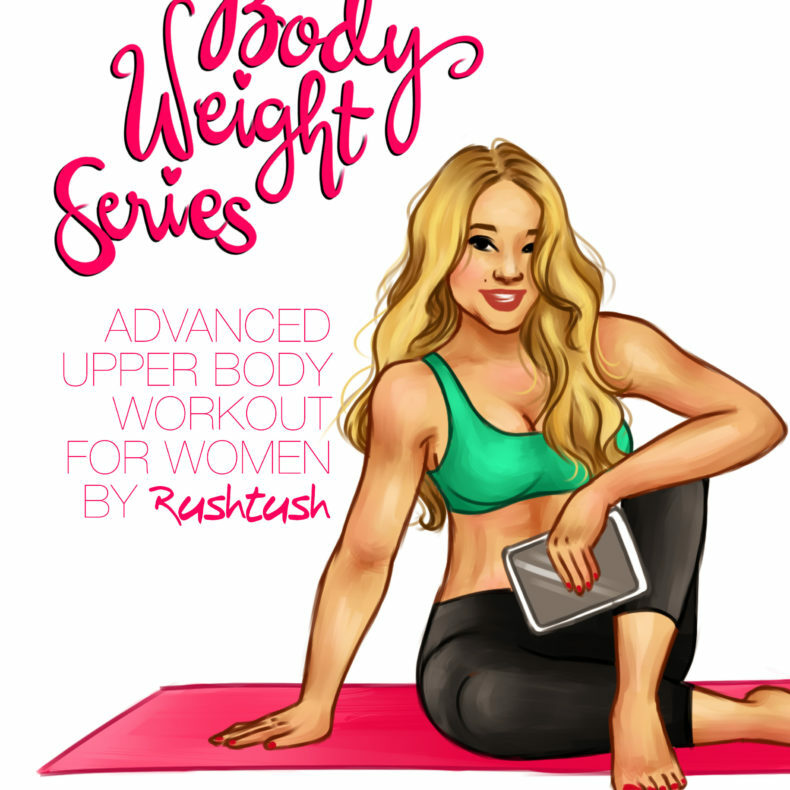 Although training will sculpt your body to achieve maximum Goddess Status. Training is not included in the Glow Cleanse. See Newbie Body Training Guide. Glow Cleanse is property of Rushtush Pty Ltd and may not be copied, distributed or shared with anyone. The ebook is not advised for pregnant females and moms who are breastfeeding. The ebook is intended as a reference volume only, not as a medical manual. Rushtush Pty Ltd does not take any responsibility for negligence while using the diet. Rushtush Pty Ltd will not be held responsible for any injuries or medical deficiencies that may or may not occur from the Glow Cleanse during or after the Glow Cleanse has been implemented. The information in the ebook is designed to help you make informed decisions about your health. It is not intended as a substitute for any treatment that may have been prescribed by your doctor. If you suspect that you have a medical problem, we urge you to seek competent medical help. 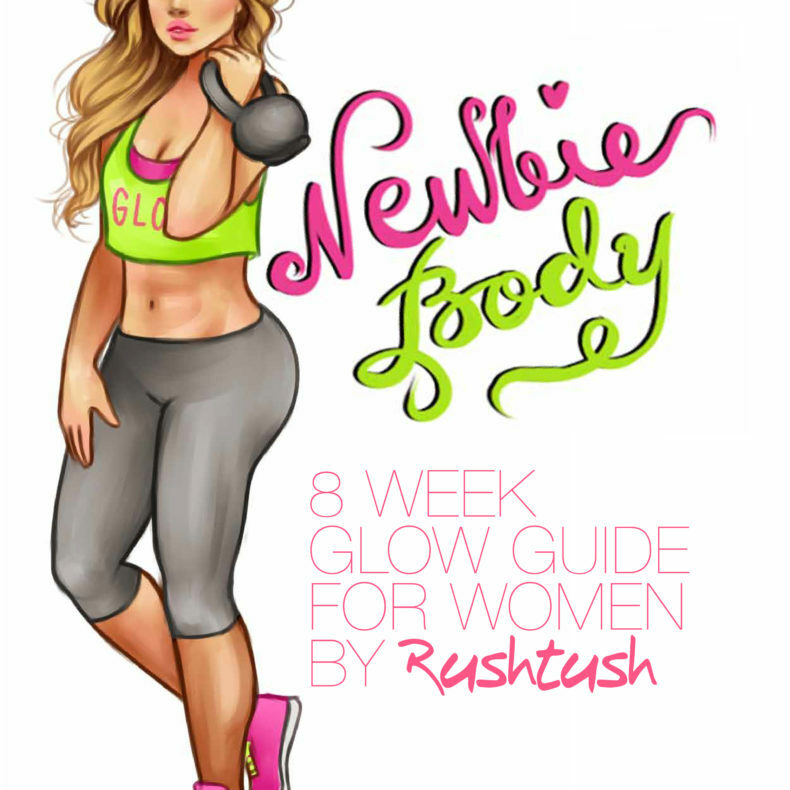 The Glow Cleanse Detox by Rushtush is copyrighted by Rushtush Pty Ltd. The Glow Cleanse has helped me structure my meals better by showing me what types of things should be eaten and when during the day. The guide is very easy to follow and can work for any budget. Most weight loss plans leave you feeling hungry and lack lustre, the Glow Cleanse leaves me full, energetic and ready for my training sessions. Additionally my skin and hair are showing THAT GLOW. Looking forward to more of these! 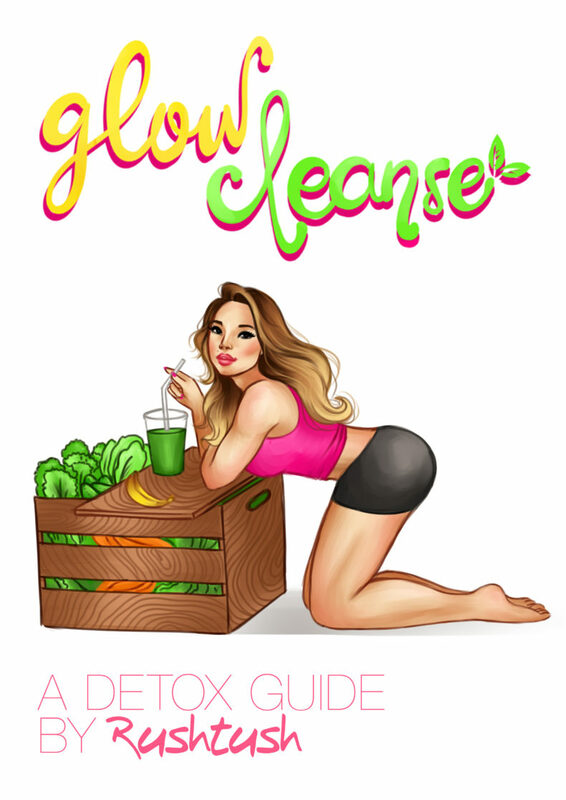 What I love most about the Glow Cleanse is it’s not a once off diet, it’s something that can be used in your daily life even after you’ve completed the 4 weeks; especially since recipes have been included. Unlike some cleanses which may limit you, the Glow Cleanse has variety so you never feel you’ve reached stagnation or boredom with your diet. I think most Glow Girls would agree that the Hulk Soup is a winner, and so yummy! All in all, I loved the way my body felt and changed, and the amount of energy I had at the end of the day! I’d recommend the Glow Cleanse in combination with the Body Weight Series for anyone hoping to get “that Cape Town glow”. The four week Glow Cleanse propelled me into a healthier lifestyle and helped me loose 4.2 kg which I have kept off several months later! I saw results within my first week on the cleanse and the cm just kept melting off as I started my fitness journey with Rushda at Glow gym. I am not a fan of diets BUT what I love about the cleanse is the delicious meals and juices- the hulk soup and hulk juice is a firm favorite. More importantly all the meals are simple and easy to prepare -for someone like me who doesn’t particularly love the kitchen that was the best news. I would certainly recommend the Glow cleanse as balanced method to kick start weight loss and healthier lifestyle. This eating plan is not just a list of things one should put into your mouth…It is a step by step philosophy backed up by experience and knowledge. With suggestions of what to eat and how to eat it as well as their benefits. Her motivation comes from real world problems, misconceptions and myths and she puts this into perspective for you and I in plain simple terms. Lets face it: we tend to complicate most things and she shows you how can simplify one of the most important aspects of life: the way we eat! She speaks about the mental, emotional and physical effects of eating well as well as the after effects of eating badly. And last but definitely not least: she’s open to any questions you may have about the eating plan. But you probably wont have any after you have read through her step by step ‘Glow Cleanse’. I first did the glow cleanse during July last year. It provided the structure I was lacking in my own eating plan at the time. The results are immediate and weight loss is inevitable. The recipes are easy to follow, tasty and nutritious and there is no risk of boredom. Each day came with some variety and I never felt starved. Since doing the glow cleanse I have incorporated the principles into my eating routine. Among my favourites are the green hulk juice, delicious hulk soup and quinoa with roasted veg. The Glow Cleanse coupled with my training at Glow Gym were a sure recipe for success. Go from Flab to Fab with this awesome cleanse! I started with rushda four months ago. I just had my first baby and was feeling unhealthy and depleted. I started the glow cleanse and was amazed at how easy it was to follow and implement into my chaotic life. I loved eating the wide variety and felt so proud as a mum as my baby was getting the great nutrients through the my milk too! I’ve lost 7kg since joining rush and and I can proudly say I’m addicted to the crazy workouts. Rushda not only has fabulous classes but her encouraging and caring energy she brings to her glow girls is inspiring! My life life has defiantly gotten a lot brighter since I stated the glow way of life!